Although acrylic painting has become increasingly popular in the past several decades, for many artists it is still no substitute for oil painting. Oil paint is a traditional painting medium that has been used by artists for centuries and loved for its durability, clarity of color, and flexibility in applications. However, getting started with oil painting can be intimidating even to artists experienced in other mediums such as acrylic, watercolor or gouache. How does a panel or canvas need to be prepared before oil painting? What kind of mediums do you use for oil painting? How do you clean up and is it safe to oil paint in your home? Do oil paintings need to be varnished or otherwise specially sealed? 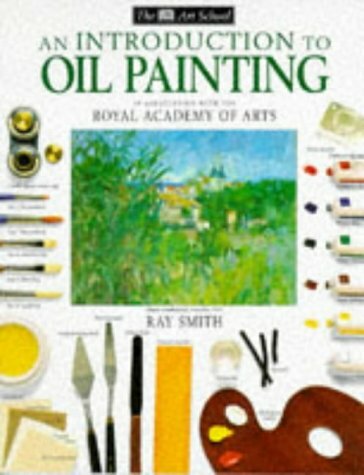 Here I will attempt to answer these and other basic questions about oil painting. You don't need to spend a fortune to get started, but you will need some specialized materials and should understand a few basic principles of how oil painting can differ from other painting methods. After reading this article I hope you will be excited about giving oil painting a try for yourself. Image above courtesy kconnors at morguefile.com. 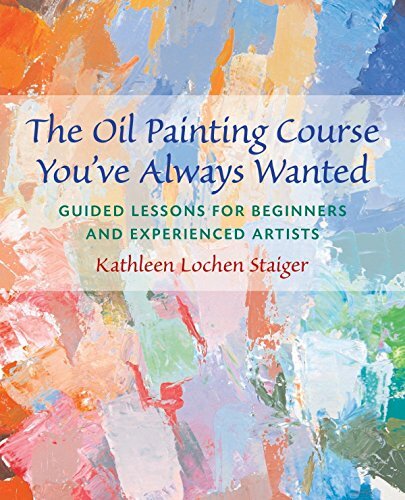 Have you worked with oil paint before? Yes, I have painted in oils before. I've dabbled with oil paint but only a little. I've never painted in oils before. What is Oil Painting, Anyway? Oil paint is made from fine particles of color pigment mixed with a drying oil. The pigments in oil paint can come from many different sources, man-made and organic. Dirt, stones, vegetable matter and even insects were used as pigments in the past and are still used today, although synthetic chemical pigments are now more common and come in a wider array of colors than ever before. The oil used in making oil paint must be of a kind that will eventually dry and solidify into a solid, uniform coating. 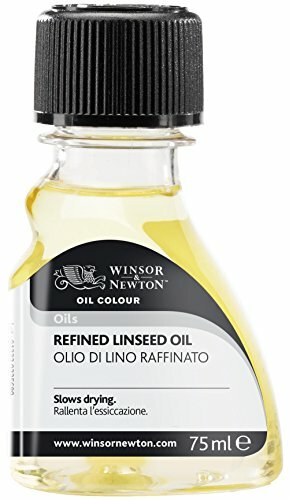 Oils such as linseed, walnut and safflower have traditionally been used for oil painting, each having slightly different drying times and clarity (safflower, for instance, is typically preferred for white paints as it is the clearest and does not yellow the color as linseed oil can.) One could not, however, use olive oil as the oil would never completely dry. In the past, artists prepared their own paints by grinding pigment and dispersing it in oil. Today, pigment powder can be directly purchased but most artists prefer to buy pre-made oil paints in tubes for convenience and consistency. Beginning oil painters may wish to start with "student grade" paints, which are less expensive than "artist grade" or top name brands. However, student grade paints can contain fillers to stretch pigment and are often made from synthetic, inexpensive materials. Those who become seriously interested in oil painting should invest in better quality paints which contain fewer impurities and the highest pigment strengths. These are some good starter kits of basic colors you may want to try out. 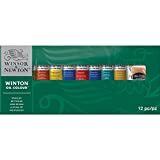 Every oil paint brand is different and with time you will find the one you like the best. A Terrific Way to Stock Up! eBay is one of my favorite places for stocking up on oil paints cheaply. You can find beginners sets as well as closeouts from art supply stores - a great way to stock up on a lot of paint at a fraction of the retail cost! Many people feel cautious about giving oil painting a try because they are worried about the paints, solvents and mediums used, and whether they are safe outside of a controlled studio environment. Certainly oil painting is different from watercolor and acrylic painting, where water is the primary "solvent" used for both painting purposes and for cleaning up. But oil painting can be done safely in the home with a little common sense precautions and care. First, try to have a designated painting room in the house with good ventilation: windows which can be kept open during warm weather, fans to encourage air circulation to the outside, or potentially have an exhaust fan specifically installed in a room for the best safety precautions. Make your painting space a room which can be closed off from the rest of the house, especially if you have young children or pets who could get into materials hazardous to them. Many oil paint mediums and solvents are flammable so they should be handled with care and with proper ventilation. 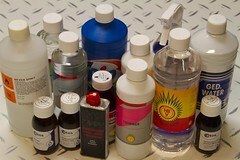 Keep solvent bottles closed when not in use. Put painting medium in small cups as you are using them and only put out as much as you actually need at a time. Do not throw used solvent down your drain; collect and save it in containers to be disposed of according to the chemical waste regulations of your community. Likewise, painting rags and paper towels are a potential fire hazard and should be hung outside to dry instead of dumped in an indoor hamper or trashcan. Do not use spay varnishes or sealants in the house; always take outside, check wind direction, and stand away from the spray as you are using them. Allow the spray to dry as much as possible outdoors before bringing inside your home. Many paints are actually quite safe to handle but certain pigments are more toxic than others. Be careful with Flake White and other lead-based paints; Cadmium and Cobalt colors are also of concern. This list is a good guide to the most toxic pigments (found not just in oil paints, it should be noted-many are used in acrylic and watercolor paints as well) However, some artists swear by these potentially hazardous colors and do not feel there are "safer" substitutes. If using them, be sure to wear gloves and avoid exposure to your skin or any ingestion. 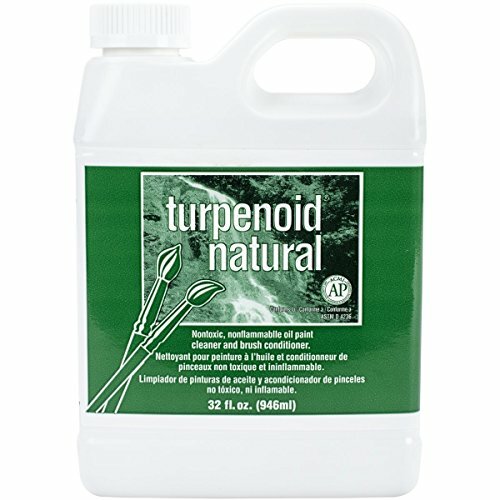 Turpenoid Natural is a great product I recommend for brush cleaning when oil painting, especially if you are concerned about solvent toxicity. It is safe to use in the home and will also help condition and rehabilitate brushes that have dried out or become unworkable. 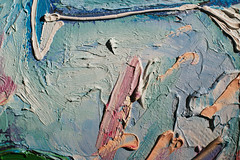 It is not, however, a solvent you should use in your paintings as it will not dry the way other painting solvents will. Oil paint can be applied to virtually any painting support surface, including canvas, wood panels, masonite, copper, cardboard and yes, even paper. However, the surface to be painted must first be prepared and primed so that the paint will adhere properly and also not cause the support to degrade and rot with time. Wooden panels were the first support typically used in oil painting and are still popular today. Gesso, a mixture of binding glue plus white pigment and chalk, is used to seal the panel from moisture and provide an absorbent surface for the paint to be applied. Up to 10 thin coats are applied and sanded to a desired smoothness, typically similar to an eggshell. Canvas became more popular for oil painting in Venice, where the shipping industry was booming during the Renaissance and canvas was cheap for artists to buy. Canvas also made it possible to create extremely large yet lightweight paintings that could be used as ceiling or wall decorations. Canvas is traditionally sealed with glue to prevent rot of the fibers with time, and then primed with a base white primer paint. Gesso can be mixed with linseed oil to make it flexible enough for use on canvas as well, otherwise it is too rigid and could crack. Canvas can be painted loose, pre-stretched on a frame, or glued to a support panel. 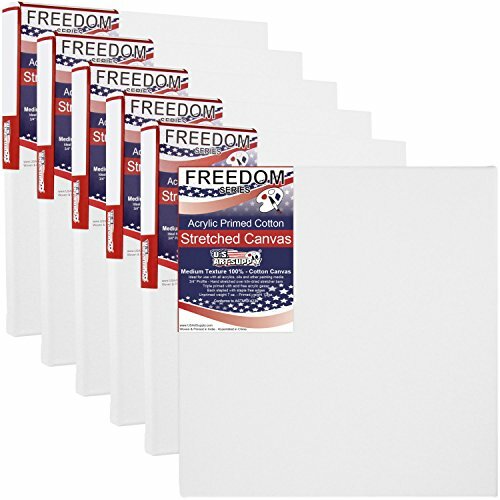 While many serious artists like to prepare their oil painting supports themselves, to get just the smoothness and absorbency they prefer, it is easy to buy canvas and panel already prepared with gesso or primer and just start painting! What works best for you? And what IS a painting medium? Painting medium is where many beginning oil painters start to get really confused. Why do you need medium, and what kind to use? Medium is not absolutely necessary, if your paints are already very soft and workable and you want to paint in thick, heavy brushstrokes. However, medium is useful in thinning store-bought oil paints to your desired fluidity and transparency as some paints can be very thick and difficult to blend at first. Medium also can also affect the appearance and properties of oil paint, speeding drying time or increasing the gloss if the medium contains an amount of varnish in it. I recommend all oil painters experiment with mediums and medium additives to determine which they find the most comfortable to use, personally. If you want paint that dries very slowly and with a flat finish, then you will likely appreciate a different medium than an artist who wants a high-gloss appearance and fast-drying paint. 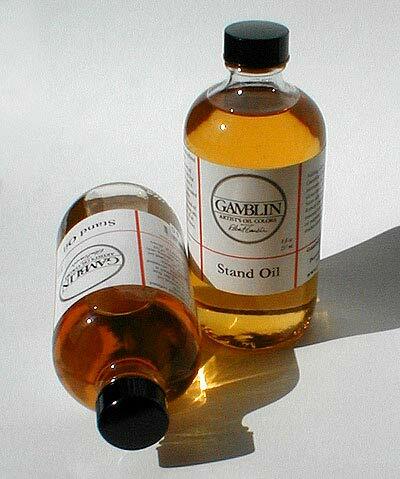 Stand oil is a very thick, honey-like oil painting medium. It is used primarily for glazing thin layers of color when mixed with turpentine or odorless mineral spirits. Want to keep it simple? 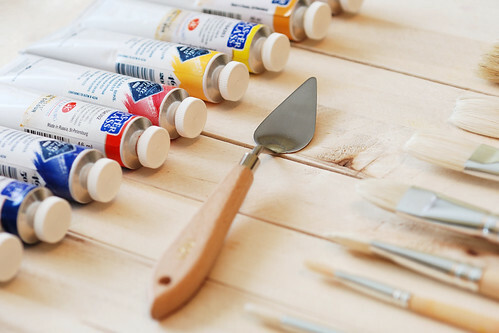 Try these pre-prepared painting mediums. Each has a different feel to it, so experiment and find which works best for you. Liquin is an alkyd-based painting medium, and actually my medium of choice 99% of the time when painting in oil. It helps paint dry quickly and gives oils a strong shine and gloss. 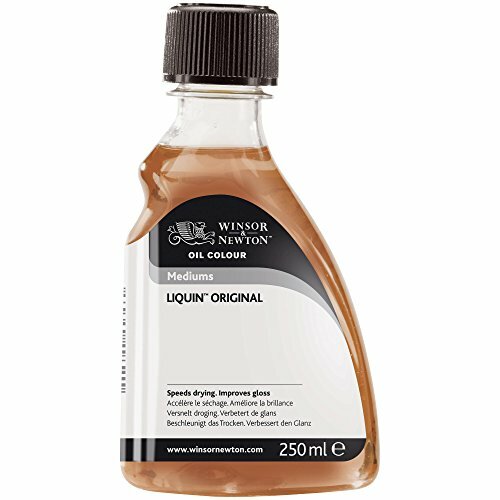 It works very well for glazing techniques as well as to help underpaintings dry quickly. This is the medium I prefer using the most when working in oil paint. 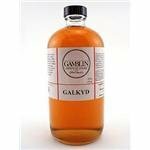 Galkyd is similar to Liquin in that it is primarily used by artists who like to glaze in multiple layers of paint, and want a glossy appearance. Some artists swear by it, however I find it a little "sticky" and thick for my personal tastes and preferences. So, what else do you need to get started? Not all that much; the following list will cover most of the rest of the basic items necessary for a beginner. Brushes. Oil painting brushes can be made from bristle hair, synthetic fibers or fine sable. Coarse bristle brushes are best for underpainting and thick applications of paint; for detail work soft synthetic or sable brushes are the best. A range of sizes and shapes (flat, round, filbert and fan) will give you flexibility in your work. Palettes. Glass or plastic sheets from the hardware store make great palettes as they are easy to clean or remove dried paint from with a razor blade. Wood palettes are traditionally favored but take greater care in use. 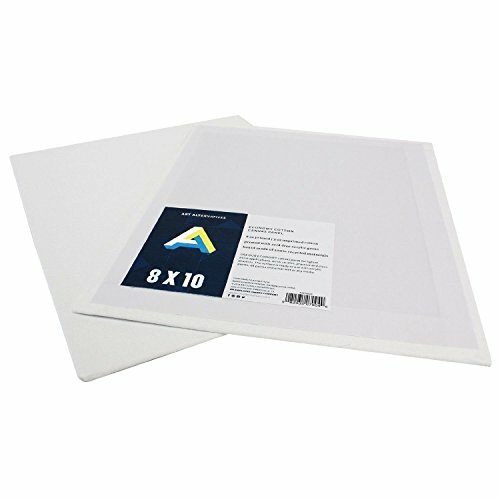 Also good to use for quick glazes and on-the-go painting are disposable paper palettes, available in large blocks and coated with a waxy finish for easy mixing work. In a bind, you can even tape wax paper to a flat tabletop and use that for a palette! Painting and palette knives. 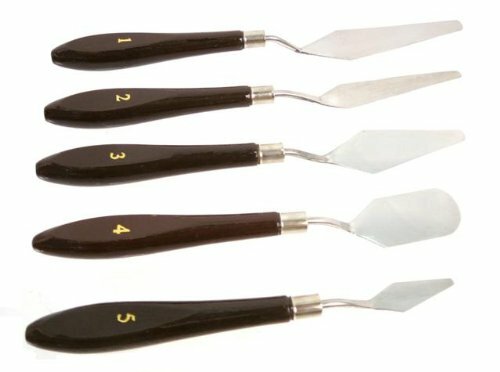 A painting knife can be used to create textured painting effects or instead of a brush for thick, impasto painting. Palette knives are used for mixing paint on your palette, either blending different hues together or mixing medium into the paint. Painting rags. Paper towels can be used, but cloth painting rags are often sturdier and won't shed lint or particles onto your painting surface if wiping away excess paint or cleaning your palette. Brush cleaner. 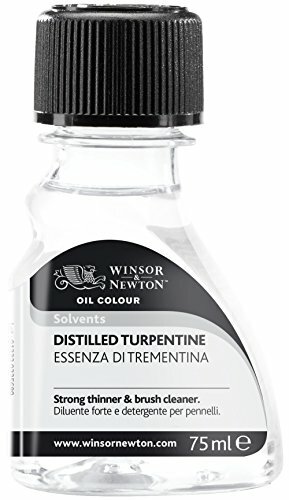 You can use turpenoid or odorless mineral spirits, or you can also use a special solution such as Turpenoid Natural to condition and clean your oil painting brushes. 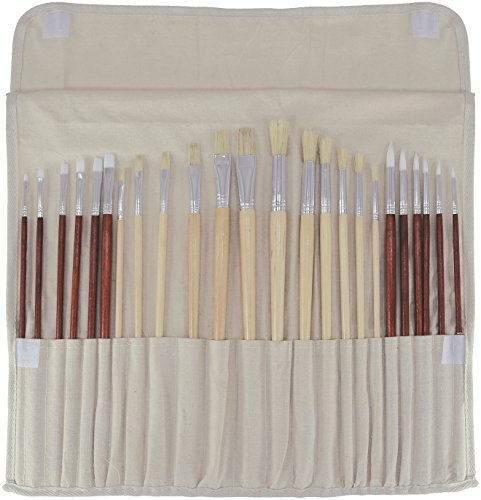 This is a very nice assortment of basic bristle brushes for use in oil or acrylic painting. Comes in a canvas tote for neat storage. Every oil painter should have a variety of pallet knives on hand for mixing and also doing knife-painting. Standing or Table-top easel. Oil painting is generally done in a vertical or angled position, so an easel is recommended for your home studio. 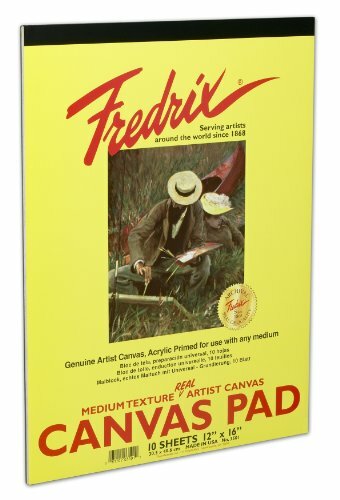 Or you can get a folding travel easel to take with you on location for outdoor painting. Traditionally oil paintings have been finished with a finishing coat of varnish applied once the painting was fully dry (often 6 months waiting time is ideal). Varnish gives the painting a uniform glossy appearance and also provides a layer of protection from smoke, air pollutants, moisture and other destructive elements. Applying varnish takes some skill and practice to ensure the coat is uniform and adheres properly to the oil paint surface. Varnish can be removed and reapplied with care to clean a painting, preserving it for many years - even centuries!Varnishing fell out of favor with the Impressionists, who preferred a flat, matte appearance to their final work. A varnished painting on panel. Note the high gloss finish! Many artists today choose not to varnish - perhaps because they do not want to spend the extra time waiting for the varnish to dry before framing and selling their work. I am personally a fan of varnishing myself, and find it can be most easily done for canvas paintings using a spray varnish in 2-3 applications. 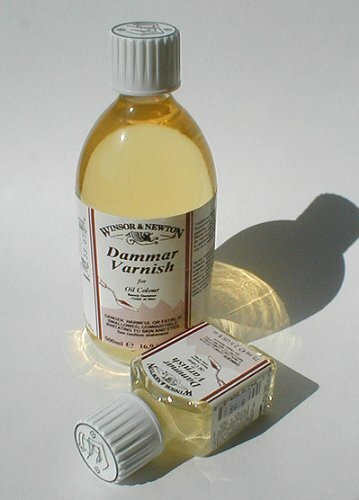 Damar is a classic varnish for oil paintings. 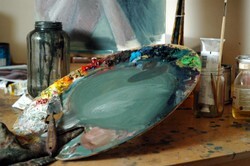 Some artists even add some into their glazes along with other painting medium. Spray varnish is easy to apply, especially for canvas paintings. 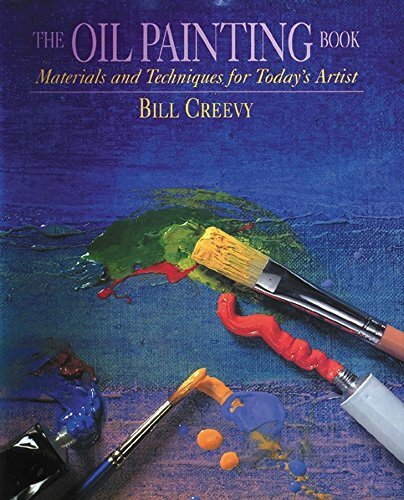 If you want to learn more about oil painting materials, techniques and applications, these books are some of the best out there on the subject. 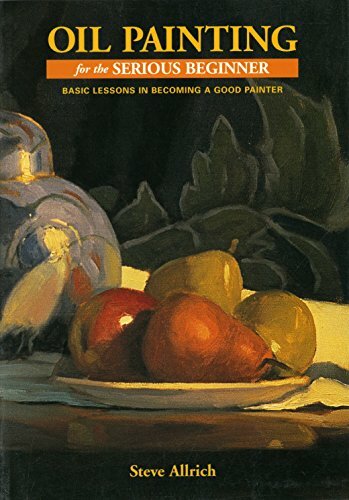 From how to stretch and prime your own canvas to color theory and varnishing, you'll learn just about everything you need to know to get serious about your art. 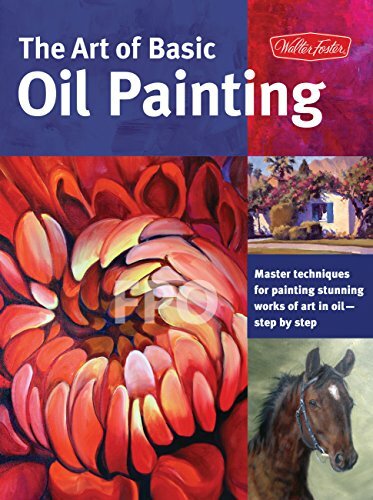 This is an excellent introductory book discussing many of the ideas I've mentioned on this webpage related to oil painting methods and materials. Simple and easy to read. Learn about surface preparation and basic techniques including glazing, alla prima, plein air, impasto and knife painting. I hope you enjoyed this introductory tutorial on oil painting. What are some of your tips for beginning oil painters? Great. Now if I just had a little talent. What a lot of good information for beginner painters on this page. I don't paint, but would love to try my hand at it one day. Obviously there is a lot to learn to get it right.